The American flag is on the ground (right) as Daniel Romanchuk poses with his trophy. 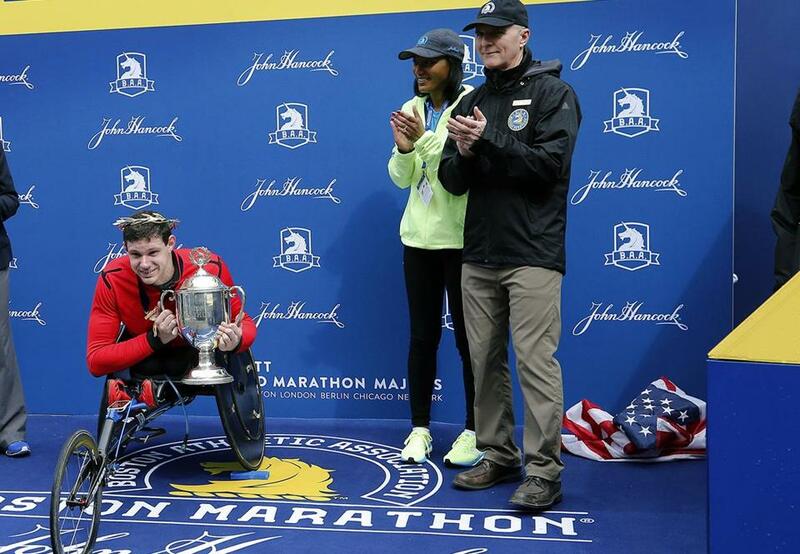 Jack Fleming, chief operating officer of the Boston Athletic Association, issued an apology Monday after the American flag was seen in a heap on the ground during the wreath and trophy ceremony for Boston Marathon men’s wheelchair winner Daniel Romanchuk. Romanchuk became the first American to win the men’s wheelchair since 1993. The flag was on the ground behind and to the right of Romanchuk while he smiled and posed for photos with his trophy. “Our flag is a symbol of freedom, unity, and community spirit — all of which are virtues that the [BAA] supports,” Fleming’s statement read.